Whether you’re operating a big business, small business or any size in between, it is important that your office space looks professional and inviting. While paintings and photographs on the walls are interesting and attract attention, they are often generic, bland and uninspiring. Instead, why not enhance your office with a bubble wall or wall fountain? Fountains aren’t just for the home. Fountains can also be used in a variety of business offices to create a professional, relaxing, inviting and interesting office environment. Wall fountains can create the feeling of luxury in a hotel or restaurant, while bubble walls can create a sense of calm in doctor or dentist offices. Even massage parlors, or nail and hair salons can benefit from a water feature by creating a calming visual for guests while they wait for their appointment to begin. Gives the area a more interesting appeal. Have prospective clients or business partners regularly come through your front doors? 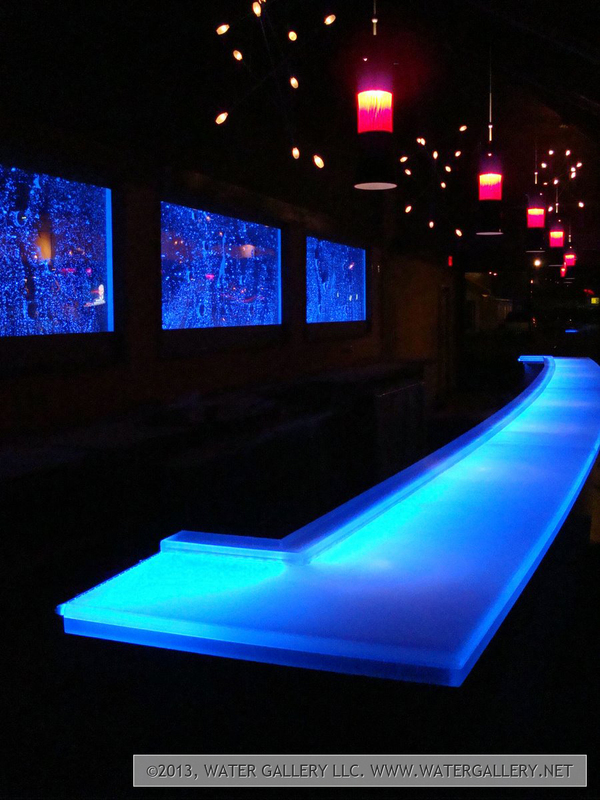 Do you want to regularly attract a constant flow of patrons into your restaurant, bar or hotel? Office wall fountains and bubble walls can be eye-catching décor or pieces of art that inspire, impress and attract attention. Brings a sense of relaxation to the room. Any dental or medical office has a waiting room and most businesses have a lobby for patients and guests to wait in. Waiting rooms and lobbies are often full of anxious visitors who wish they were anywhere else. Even healthy patients and business guests can be anxious as they wait to be called in for their exam or that big business deal meeting. Fountains have an element of relaxation that distraction tools such as magazines, TVs and elevator music can’t produce. Besides the peaceful trickling of a fountain, business fountains can also have a pleasant, aesthetic look to them. When patients and visitors to your business office feel calm and relaxed, their experience is more pleasant and they will be more willing to return. Makes your business more memorable. Nobody wants a business space that blends in with all the others and isn’t memorable. In fact, patients, customers and patrons will be more likely to turn into repeat visitors if they had a positive or memorable experience at a business, spa, restaurant or medical office. Low maintenance. While indoor bubble walls and fountains add a professional, interesting and calming element to your business or office, they will be subject to algae, staining and calcium build-up from hard water use. Occasional cleaning will be necessary to keep your fountain running and looking great. However, depending on the style, materials and colors of your business’ fountain, these signs of use can be hardly noticeable, leading to less frequent cleanings. No cleanup necessary. When one thinks of water fountains, images of sloshing, large outdoor fountains may come to mind. With Water Gallery’ water fountains, one doesn’t have to worry about accidental sloshing or spray that can get floors, carpeting and possibly guests wet. Our business water features are self-contained meaning you, your staff and your clients will remain dry and your floor and carpeting will be safe from devastating and unpleasant mildew and mold. Creates a professional look. Free-standing or wall fountains can also come in clean, sleek designs that make a bold statement, exude professionalism, success, integrity and modernity. If you want your business to look modern, trustworthy and calming an office water feature will do the trick. Water fountains for business offer prime places for your company’s brand to be visible to guests, patrons and patients. Water Gallery can make fully customized water features featuring unique material combinations, sizes and shapes as well as have the ability to affix or engrave your company’s logo on the fountain. 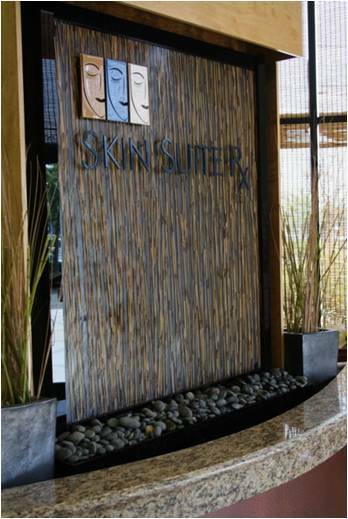 Business logos can go on any of our business fountains and bubble wall panels. Logos can either be made of vinyl and affixed to the water feature or be etched directly onto the fountain. Etched logos can be engraved onto any glass or stone water features. Vinyl logos are available on any color of glass fountain. Another option for personalizing your business’ office wall fountain or bubble wall is with a “pegged” logo. “Pegged” logos are made apart from the fountain and later mounted to the surface. These types of logos produce added texture and ensure your business identity stands out. Our specialists will consider the size, location and complexity of your logo and the type and extent of work needed for your custom logo water feature when estimating the cost of your project. The level of detail as well as the color of the fountain will also be factored into the costs. Indoor water features can enhance the look and feel of a variety of businesses including medical offices, hotel, restaurants, salons and corporate offices. Water fountains can make a business more memorable to visitors, create a more calming guest environment and make a space more interesting and professional while also being easy to maintain. These water features can also be customized with your company’s logo for added branding, professionalism and uniqueness. If you’re ready to take your business to the next level, contact Water Gallery to purchase your custom business wall feature.